Dr Sarah Geoghegan from Dublin is a paediatric doctor who left her job at Temple Street Hospital to volunteer with Médecins Sans Frontières/Doctors Without Borders. Based in the world’s newest country, South Sudan, she talks about providing care in an environment beset by tribal violence and malnutrition. I have always thought that humanitarian work would form part of my career in some way but you can never really know until you work in the field. I joined MSF in March 2011. I reached a natural gap in my training In Ireland and decided it was a good time for me to put my ambitions into practice. I chose MSF because it is a strong humanitarian organisation with a solid medical focus and that was important to me as a doctor. Words that come immediately to my mind when describing South Sudan are ‘hot’, ‘dry’, ‘flat’, ‘tukuls’ (thatched huts) and ‘cows’. A typical south Sudanese village or town is an arrangement of tukuls. Each tukul or group of tukuls is surrounded by a bamboo fence. The arrangement is very particular to South Sudan; I have not seen it in other African countries. The people are very friendly, where I am. They speak Nuer and Nuer greetings have the potential to go back and forth for half an hour if you know enough responses! The people have such a sense of fun it is easy to forget the years of war and ongoing hardship that most of the people I work with have gone through. Cows are everything here. It is said that there are more cows than people in the country and marriage, divorce, children, celebrations and disputes all involve cows. Unfortunately, they are also at the centre of a lot of inter- and intra-tribal fighting and frequent cattle-raiding of various scales continue throughout the country. South Sudan is a very complex place. The medical needs are great, with many people having no access to any form of healthcare. Major medical problems are malaria, malnutrition, kala azar, TB and the influx of wounded after conflict. MSF is trying to address these issues through 17 projects currently open in the country. I am working in a malnutrition project in Bentiu, which is the capital of Unity State. We have a fixed clinic with ambulatory services and an inpatient facility for the severe cases that have to stay for treatment. Twice a week we go out into the community with so-called mobile clinics — we just pack our medical supplies and chairs and tables and go to the village, where we do consultations in an open space or under a tree in a central area that people can easily come to. The reasons for malnutrition in South Sudan are multiple, but one major contributing factor is the massive escalation in food prices and the high inflation rate, as well as insufficient harvest from the last season, which means that people are already running out of food for this year. We treat many children in Bentiu but also frequently receive patients from neighbouring counties, where people may walk three or four days to reach us. They are coming from areas with little or no healthcare facilities and usually arrive very sick. Outreach and mobile clinics are a very important focus of our project, however one of the big frustrations of working here is that many of the areas where we know there are very high needs have been inaccessible for some time due to land-mines on the roads. Typically, our day starts at 7:30am, when the team discusses the plans for the day over breakfast; we are updated on any new security issues and then co-ordinate our movements for the day. Then the medical team goes to the clinic. As the doctor, I am principally responsible for the inpatients, however I also see any outpatients that have more complicated medical issues. First thing in the morning I see the sickest patients with the nurses and make any necessary changes in their treatment. The most severely-ill children are kept together in what we call ICU and by Western medical standards, the children we see certainly meet the criteria for admission to an ICU. But with our limited resources, our ICU translates into a thatched hut with close nursing care, tube-feeding and the possibility of oxygen, if needed. It has been amazing to see children that I know who would probably be attached to machines in Ireland having daily blood tests, or continuous electronic monitoring, make incredible recoveries. Of course, there is also the reverse situation, where there are children who sadly cannot be saved with the limited resources that we have. The rest of the day is spent seeing the admitted patients and new admissions as they arrive, coaching and supervising the nurses, seeing more complex ambulatory cases and generally responding to whatever the day brings. Usually, the word ‘typical’ cannot be applied. For example, yesterday I was called to the weighting area to see a child. When I got there I found five women, two crying and one holding a child wrapped in a blanket; the child was unconscious and the mother reported that he had been like that for two hours. We quickly brought him to the ICU and checked his blood sugar level, which was very low. Our nurses rapidly responded and within two minutes the child was sitting up and crying. We then gave him some of the therapeutic peanut paste the children are given in the clinic and he ate the whole sachet in about one minute — the child was starving. I am lucky in that I have a great team of enthusiastic nurses and healthcare assistants and I was very pleased to see such a rapid emergency response. There are many challenges medically, especially working with malnutrition, as the children can deteriorate extremely fast with very few warning signals. The more complex cases also pose a big challenge because we have no diagnostic facilities, so all decisions are clinical. Another issue I find very tough is that often mothers are forced, due to their social circumstances, to take children out of the clinic when they are really still too sick to leave. This particularly happens when children come from far away because the mothers have often left all the rest of the children behind to bring a child to us when he/she becomes critical. Usually, the eldest is looking after the rest and then eventually, those left behind start to run out of food. These are impossible decisions for mothers to make — five children at home without food and one in our clinic. Last month, a mother had to leave because she was from the neighbouring county — her husband had been shot and was in the capital having surgery. She was eight-and-a-half months pregnant and had her other four children in Bentiu with her but no family supporting them for food or shelter. She was petrified that she would deliver in a place where she had no family support and no way to feed her children. Her sick child was not ready to be discharged and there was no possibility of follow-up when they returned to her county but she left because she had to. These are impossible decisions no mother should have to face but they are forced to on a regular basis here due to such poor access to healthcare. Living conditions-wise, it really isn’t too bad. We have six foreign staff living together in a small house. We have a normal toilet and a shower. The heat can be the most difficult part, as we have no generator at night so no possibility of fans and now it can be up to 35 degrees at night — not something us Irish are used to! Of course, we do share the house with a couple of friendly rats, a good few lizards and even the odd snake. Fresh food is the thing I miss most. There is no fruit and almost no vegetables available locally, which is difficult. I think when I finish this mission, I will never want to look at a tinned peach again. To relax here, we like to sit outside and chat and have a beer. A major Sunday event is a highly competitive game of Monopoly, which as of today, every member of the house has won once so the next one is serious! It’s also nice to watch a film together from time to time or Skype my friends and family back home. We are very lucky to have the internet here. But I still miss things from home; friends and family, chocolate, nice wine and the sea — coming from Ireland, I always find it difficult being in a land-locked country. There was a mixed reaction amongst my friends and family when I left for South Sudan. They were pleased for me as they know this is something I really wanted to do but also of course there were some concerns, particularly as MSF is known for its work in conflict zones. However, now that I have been in the field for some time, their concerns are no longer as great, as they can see that it is important to be present in these places and they are mostly just really interested to hear stories about my life here — which, if they let me, can be very long sometimes! 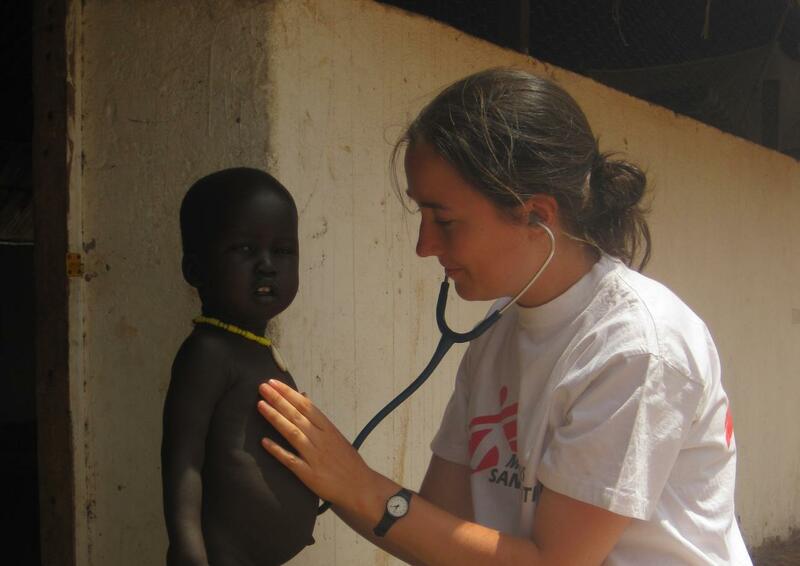 Dr Sarah Geoghegan is one of 50 Irish volunteers from a range of backgrounds — doctors, nurses, engineers, accountants, project managers, and human resources specialists — who work with MSF across the globe. Find out more about Irish Volunteers.